Drapes are sold per panel. $119.99 per panel Wow! Red hot tiki atomic loungy look! Add a mid-century look to any room. Deluxe upholstery grade (expensive!) fabric.This is the most swinging of all atomic designs! Even has that wondrous "tiki lounge" feel! 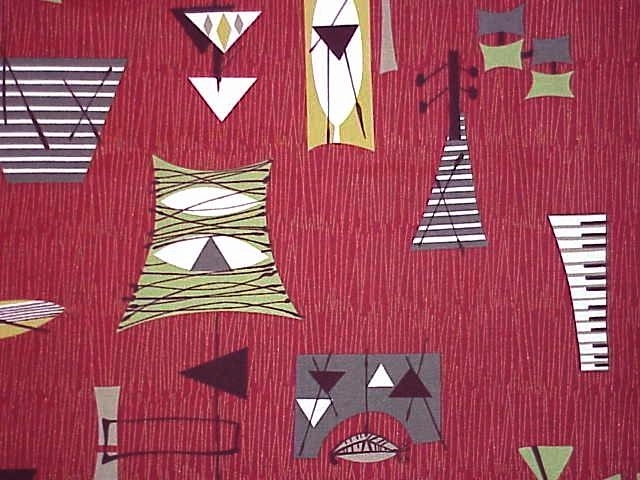 Everything mid-century has to offer! Stupendous vintage 50's palette! The colors are tremendous and there're oodles of metallic gold streaks all over the red background! Sooo much fun for your mid-century fun house! Matching valance and café curtains available. Machine wash and dry. Matching pillows available.